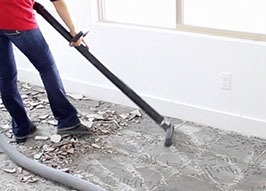 At DustSharkz we are leading the industry in dust free tile removal Scottsdale and surrounding areas. 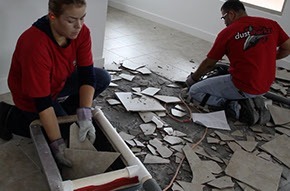 First of all DustSharkz employees all former tile and stone installers who have over 25 years in the flooring side of residential remodeling. Our team is extremely familiar with the problems associated with the removal process and have been dealing with it for years. 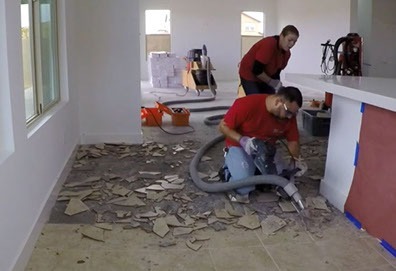 This experience gives us edge when it comes to knowing whats needed for a successful installation of new flooring and how we would like to see it if we were to install the new floors. 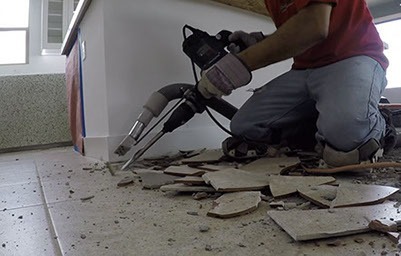 The first step of dust free tile removal starts with chipping and breaking up the old tile. Secondly, DustSharkz removes all the heavy pieces of tile, thin-set, and debris, disposing of in a green facility. Finally grinding off the thinset/mortar leaving it smooth, dust free and ready for new flooring. At DustSharkz we are completely committed to providing you with a healthier, faster and cleaner option for your home, family, and business. No more messing around with under-equipped and undertrained workers that are just trying to get through a tough job as quickly as possible with the tools they have laying around. DustSharkz gets the job done in a completely professional and specialized manner saving your precious time, money and health. When I need tile removal I now exclusively use DustSharkz. I’ve used them dozens of times. They provide great service at a fair price and the techs are professional and courteous. They leave the site clean and dust free. I would recommend them to anyone who wants their old tile gone without all the mess and associated problems. Recently hired DustSharkz to remove 1600 sq ft of porcelain tile at the home of one of my clients. The service was excellent! The guys are so hard working, they were fast, polite, and they left the job amazingly clean and ready for the new flooring. None of the horrible lingering dust that normally happens. The times I have used other services that make a lot of promises, put up yards and yards of plastic, but ended up being so dirty and dusty that they actually set off the fire alarm. I will never go back because my clients deserve better. DustSharkz made this part of the job easy, clean, and quick so we could move on with the rest of the remodeling. I highly recommend them! We had the guys from DustSharkz out to remove the builder grade tile in our home. So we could install the tile of our choice. They showed up when promised, worked diligently and professionally to get the job done and they left the site looking brand new. It’s not a quiet process, so maybe plan to be out of the house for the day, but worth the extra effort to have it done dust free. I had a black briefcase on my desk during the process and you wouldn’t have known anything had gone on in the house. The briefcase was still black and not covered in dust. I definitely recommend them.